In November 2001, Marxonian Robert Moulton discovered a previously unnoticed 1925 film appearance by Zeppo. Robert was perusing www.newspaperarchive.com when he discovered a 1925 notice in an Ohio newspaper for a Paramount film called A Kiss in the Dark. Deep in the cast listing was a credit for "...Herbert Marx, one of the Marx brothers in the 'I'll Say She Is' company" (below). A Kiss in the Dark was released on 6 April 1925, three months after Harpo's Too Many Kisses, and stars Adolphe Menjou, Aileen Pringle, Lillian Rich, Kenneth MacKenna and Ann Pennington. It was shot at Paramount Studios in New York and directed by Frank Tuttle, but Zeppo was not listed in the cast in the 1921-1930 AFI Catalogue. Another expert on early films, Robert Farr, went to the Library of Congress to look for some confirmation, but Zeppo was not mentioned in reviews by The New York Times, Variety, Moving Picture World, Motion Picture News and Harrison's Reports. Farr finally found a pressbook for A Kiss in the Dark in Paramount's copyright deposit (left). Zeppo was not in the official cast list, but as one of a number of Broadway guest stars that included Kitty Kelley of "Miss Jane McKane" and Eden Brand of "The Firebrand". The piece doesn't say which role Zeppo was cast in, but as the character played by Lillian Rich is described as having "eyes for every personable chap who crosses her path", there seem to be a plausible role for Zeppo. Marxonian Joe Adamson discovered considerable material on A Kiss in the Dark in The Margaret Herrick Library of the Academy of Motion Picture Arts & Sciences in Los Angeles (file keepers of stills and scripts donated by Paramount), but couldn't find any material relating to Zeppo's appearance in the film. 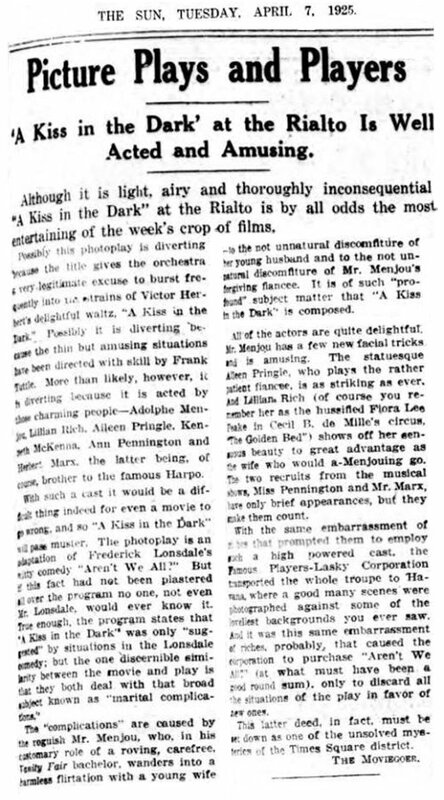 The confirmation finally came in June 2013 when Michael Hayde found a review of A Kiss in the Dark in New York Sun, 7 April 1925 (right), which mentions Herbert Marx, "brother of the famous Harpo". The review says further: "Miss Pennington and Mr. Marx have only brief appearances, but they make them count." This discovery may suggest that Zeppo was exploring the possibility of an acting career away from his brothers as early as 1925 - or he might simply have been inspired by Harpo to pick up some easy money during the day. 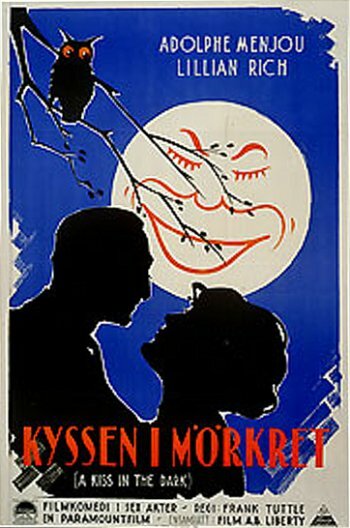 The film was also shown in Europe, titled Kyssen i mörkret in Sweden and Suutele pimeässä in Finland.